FRAMED PRINT. 22x18 inch (56x46cm) Framed Print with Black Satin with Off-White Digital Mat. Artwork depicting Paranormal Photography. Photo by professor Barrett a Gordon Salt shows how the Combermere photo might have occurred, if someone vaguely resembling Lord C had sat briefly in the chair (2 of 2). Shipping from USA. 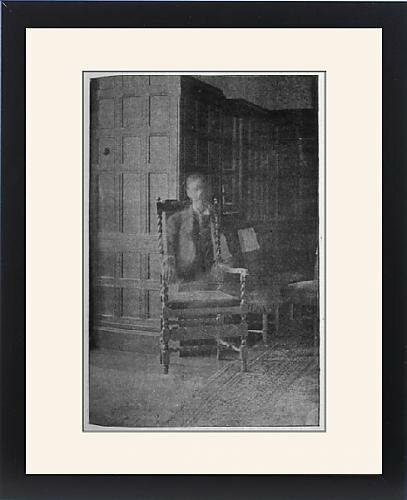 Artwork Description... Photo by professor Barrett a Gordon Salt shows how the Combermere photo might have occurred, if someone vaguely resembling Lord C had sat briefly in the chair (2 of 2).